By most standards, the beginning of my parents’ marriage did not bode well for its longevity. After meeting at a dance and dating for all of three months, they hopped on a bus to Las Vegas and got married. Because my father was in the army, they lived apart at first, only getting together for the short periods of time his leaves allowed. Then he shipped off to Europe with his outfit and was away for over a year. Two crazy kids in love. Although they are both gone now, Valentine’s Day still means more to me than a Hallmark holiday; it is an annual reminder of the strength of their union, brought together in a time of war and fortified over the years as a relationship built on love, commitment, and shared values. My brothers and I were lucky to be able to celebrate our parents’ 50th wedding anniversary with them. My mother passed away in 2000, a few years shy of their 60th. Tomorrow, on their Valentine’s Day anniversary, I will say a heartfelt “thank you.” Thank you for giving us a happy, secure childhood. Thank you for emphasizing the importance of an education and continued learning. Thank you for instilling in us a passion for travel. Thank you for showing us what love looks like. Thank you, Mom and Dad, for taking a chance and hopping on that bus. We are grateful. When did the holiday season – and especially Christmas – get so over-the-top stressful? My childhood memories of pre-Christmas preparations include buying and trimming a tree, placing decorations around the living room, and stringing lights in front of our house. Granted, most of these tasks fell to my parents, but I don’t recall a heightened sense of stress related to any of these activities. The tree wasn’t decorated in an overall theme, nor were the trimmings color-coordinated. The ornaments were a mixture of well-loved heirlooms handed down through the generations, holiday crafts that my brothers and I made at school, and decorations that my mother bought over the years at after-Christmas sales. Our living room shelves and the credenza beneath it had various Santas, reindeer, and snowman decorations placed among the books and next to the TV. As Christmas cards arrived in the mail, they filled up any remaining spaces. The outdoor lights – the large, tear-drop shaped, multi-colored bulbs that everyone had – were strung in a straight(ish) line from the far corner of our garage, across the front of our house, then down to a couple of the bushes below. It was pretty much the same thing every year… and we wouldn’t have wanted it any other way. Fast forward to the age of social media. Friends on Facebook post pictures of perfectly decorated homes (inside and out) and lavishly prepared meals, Houzz offers a myriad of ways to accessorize our rooms for the holidays – in prices ranging from a lot to are you kidding me?, and Pinterest is bursting with photos of just the item, product, display, project, recipe, etc. that we need to purchase or create to assure our holiday is perfect. Now, don’t misunderstand: I am not immune to the eye candy that is everywhere this season. I love to see what others have done to decorate or which appetizers, cocktails, or meals they have planned for their holiday celebrations. But, even as I admire their decorating talents (to say nothing about the off-season storage space they must have) or their creativity in the kitchen, I prefer the low-key way my husband and I choose to celebrate the holidays. I realize that decorating every nook and cranny with just the right seasonal accessory or wowing family and guests by baking and serving a Chocolate Espresso Bûche de Noël fills some with joy. We’re just happier to eschew the tree (there really isn’t room for one anyway) and put out fewer, but well-loved, decorations. And, while we enjoy attending holiday parties given by friends who love to entertain lavishly, our get-togethers tend to be small and pretty casual. If I find myself grumbling about being stressed out or feeling like I don’t have enough time to do the things I “need” to do, I stop and consider how much unnecessary burden I’ve willingly put on my own shoulders. Am I doing what pleases me, or am I trying to emulate someone else’s version of the holiday? What works for one person, or one family, may not be a good fit for another. And that’s OK. This season isn’t about an exquisitely decorated home or perfectly prepared food, it’s about the people in our homes and those who share our food. That’s where the memories are made. My mother-in-law is visiting us for a few days this week. This means that we paid extra-special attention to cleaning the house prior to her arrival. Although she’d never say anything directly, she’s the type that notices dust and stains and things out of place. She is also old fashioned enough to consider the cleanliness of the house to be in my purview, not her son’s (just like she is old fashioned enough to insist on assigning my husband’s last name to me even though she’s aware that I kept my own). We are very different in many ways. In addition to my not-quite-to-her-standards housekeeping, we have different political and world views. She is extraverted and loves to talk and I’m aware that my introverted tendencies puzzle—perhaps disappoint—her. I know I should call her now and then to just chat, but chatting on the phone for long periods of time is my definition of one of the rings of hell. I have tried to introduce her to texting (my favorite way of non-face-to-face communication), but she isn’t very interested in, or comfortable with, technology. She is also loves clothes and shoes and is a lot more focused on fashion and style than I am. So, you might ask, why have I chosen her for my GratiTuesday post? Of course I am grateful for her giving birth to my husband and raising him to be the man he is today. But it’s also because she is a truly remarkable woman. My mother-in-law has more energy than just about anyone I know. She travels, entertains, works out, volunteers, plays bridge several days a week, and is the first one to extend a very capable, helping hand to anyone who needs it. She always has a smile and a kind word and makes friends wherever she goes. She has endured more than her share of challenges and tragedies in her life but she has managed to keep a positive attitude and push ahead. I have never seen her complain or burden someone else with her pain. She has a few health issues but you would never know it by talking to her or observing her. 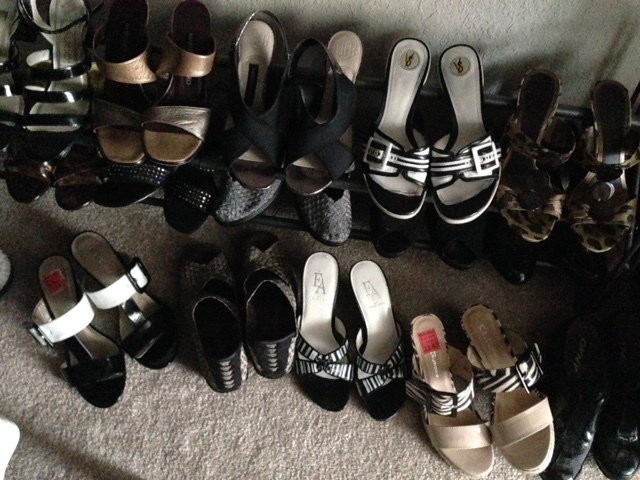 This is just a small portion of her shoe collection… which puts mine to shame. One of my mother-in-law’s favorite things to do is shop at thrift stores and consignment shops. She can put together a stunning outfit on less money than I might pay for a single pair of shoes. She is teeny-tiny so she wears clothes beautifully and, at 83 years old, she rocks skinny jeans, leather jackets, and high heels. Her favorite color combination is black and white, which she augments with touches of red, purple, and animal prints. She loves shoes and has more pairs (often bought second-hand) than most people I know – and they are way cuter and higher heeled than most of mine. My husband and I will enjoy her while she is here and probably heave a sigh of relief when she is leaves. We will become a lot more relaxed and a less concerned about a little dust here and there. Our house will soon look comfortably lived-in and become quiet again. And, we will miss her. I should probably give her a call in a week or so just to chat.